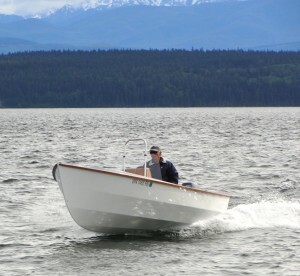 Launched the boat in May with a Yamaha 20 HP. 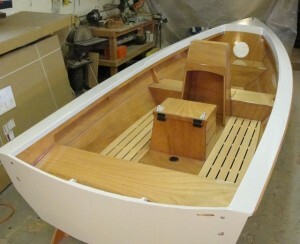 Our skiff is almost complete! We are waiting on the new adjustable height windshield & mount, but besides that we only need to install the motor and cables and a few other small things. We were pulled off skiff building for a good part of the spring, filling orders for our other business, PT Foils, but now we are full speed finishing our skiff and getting ready for a cross country tour. 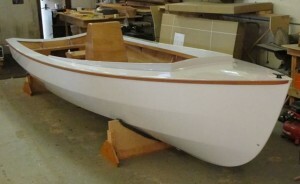 We are going to the Wooden Boat show in Mystic, Connecticut ( http://www.thewoodenboatshow.com/ ) in late June and then touring New England. E-mail us if you want to see the boat. We have also scheduled having our boat tested by the Coast Guard at their testing facility in Maryland. This testing involves filling the boat with water and testing for flotation and stability when flooded, among other things. The testing we are doing is voluntary but seems important on a boat we are promoting for it’s seaworthiness. 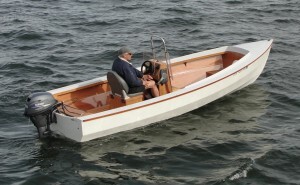 There are many details on the skiff since the last blog post, but soon it will be out of the shop and we will be able to take good photographs. Our shop has 7’ ceilings and while it is easy to heat, the light for photos is not so good. 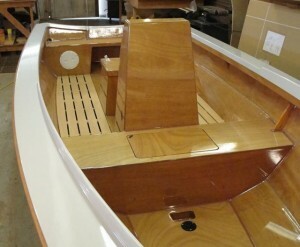 P T Skiff kit is on it’s way to New Zealand. We weighed our boat recently. 340 pounds without the engine and some other things. This is about the same as the first prototype. We chose the same engine that the first prototype had, a Yamaha 20. Our first kit buyer, J. Brandt chose the Evinrude E-TEC 25. Comparing performance will be very interesting. 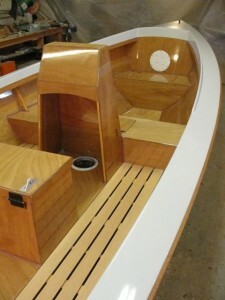 Following are a few photos of the boat as it looks right now.